So I tried to change some data in the _gamedata.inc file, like for example: the cost of a Gondor soldier from 200 to 100, but that didn't do anything and I don't know why. Within the shortcut on my desktop I changed the goal to: "C:\Program Files (x86)\Electronic Arts\The Lord of the Rings, The Rise of the Witch-king\lotrbfme2ep1.exe" -mod "C:\Users\remo\Desktop\Edain Modding\Mod". The "mod" is thus located in C:\Users\remo\Desktop\Edain Modding\Mod. I read something on the internet about the _gamedata.inc in the installation folder having more priorities than the modded file. Can someone please explain why this didn't work? Let's see if I understood well: did you create a copy of your edain_data.big file or did you change the existing one? First of all, thank you for your awnser. But when I name the file _____zmymod.big it wont be read last, because of the "_____" it will be on top, right? 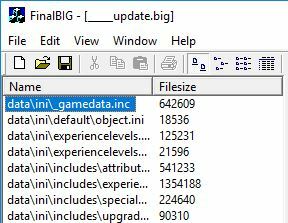 And will the data from _gamedata.inc in the main folder be overwritten by my .big mod file when the modded file is the last one? Also does the game know what data it needs to pull, and where it is located? So do I have to give the game a location to search for the _____zmymod.big file? And my final question: When I want this mod to work on multiplayer, Is it that the only thing I need to do is give this file to my friend, or is there something else I must do? No, the "_______" characters are there because thats what will make the game read it last. And every file that is in the big that is loaded last (i.e. my example) will overright the original SUM2 files and the original edain mod files. now you only have to shorten the path so that it starts with data\... then press ok. now your modded file is in your new big file and with the correct path. when your modded big file is ready drop it in the main directory of your game (where you installed rise of the lich king. all the other edain files are located there too). yes that is correct your friend only needs your modded file. this is another beauty to this way of modding . You only have to make sure that your friend has the same game and mod version like you but i think that is to be expected .